Feature Is Our Sensitivity Slipping Away? Is Our Sensitivity Slipping Away? Who would have believed, 70 years ago, that Jewish stores today would sell clothes with yellow stars on them? Time, they say, heals all wounds. While it is true that the pain of traumatic memories may recede over time, it does not necessarily mean that the mind expunges the recollection. Usually, the mind retains an awareness, but manages to relocate it to a more remote recess of the conscious mind. For the generation of Holocaust survivors, a long time was needed to soothe the suffering they experienced. Concentration camp survivors were known to suffer nightmares and sleep terrors despite their concerted efforts to overcome their past. Children of survivors grew up knowing that their parents and nation underwent unspeakable horrors, an indescribable ordeal. For them, time was somewhat of a salve, but not a panacea. As the son and grandson of Holocaust survivors, I was keenly aware of the magnitude of the krig (war). Although my parents were not interned in the camps, nevertheless they lived as refugees in constant fear of deportation and lost several close relatives. The memory of the Six Million was ever-present, and this alone was enough to impress upon my siblings and myself that “we” suffered a terrible loss. I think back to the time when, as a fourth-grader, my yeshivah decided to enhance our school experience by introducing a music curriculum. This innovation was most unusual in mainstream yeshivos, and we looked forward eagerly for our instruments to arrive. The day I received my melodica, a wind instrument with a keyboard, should have been a most joyous childhood memory. Instead, when I arrived home and showed it to my father, I saw the blood drain from his normally smiling face. He did his best to hide his consternation from me, but I could sense that he was not happy. No amount of explanation could placate my father. He could not procure a melodica from any other source, but on the other hand, no child of his would display the name of that nation, and he scratched the country of origin off the brand-new instrument. In time, I noticed other melodicas with similar scratch marks. In some sense, we considered it a badge of honor. At the time, I pictured my father returning from his first visit to Israel some 25 years after the Holocaust. He was enthralled by the rebirth and growth of our nation, both spiritually and physically. He could not resist singing the praises of the Holy Land. Neither the long lines nor the lack of modernity could dampen his excitement as he described what he saw. The only hint of consternation I detected was when he mentioned the brand name of the taxis he drove in, made once again in that dreaded land. It is now 70-plus years since the nightmare of the Holocaust came to an end. Notwithstanding the fact that by biblical standards 70 years is considered a generation, in the history of our nation the Holocaust is close by. In the past, when the Jews suffered death and destruction, the collective grief that engulfed our nation lingered on. 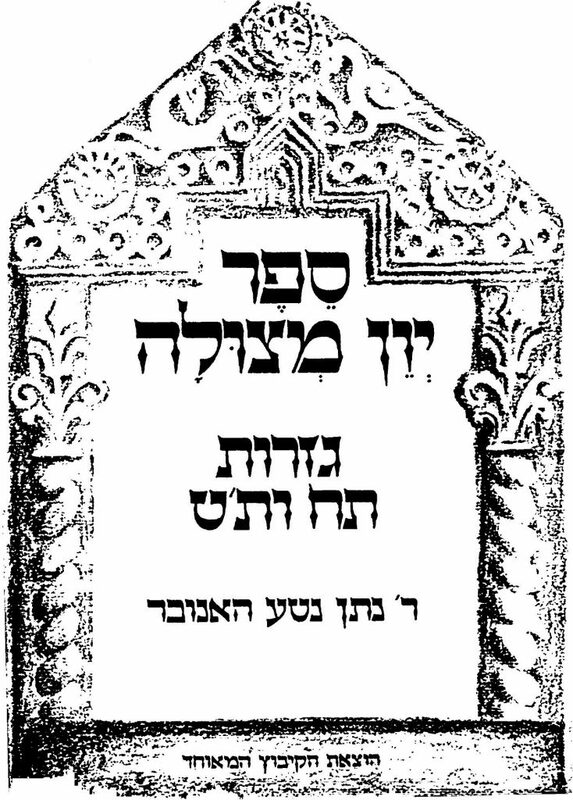 Sefer Yevein Metzulah, written in response to the pogroms of 1648, in which 100,000 Jews were murdered. Hy”d. 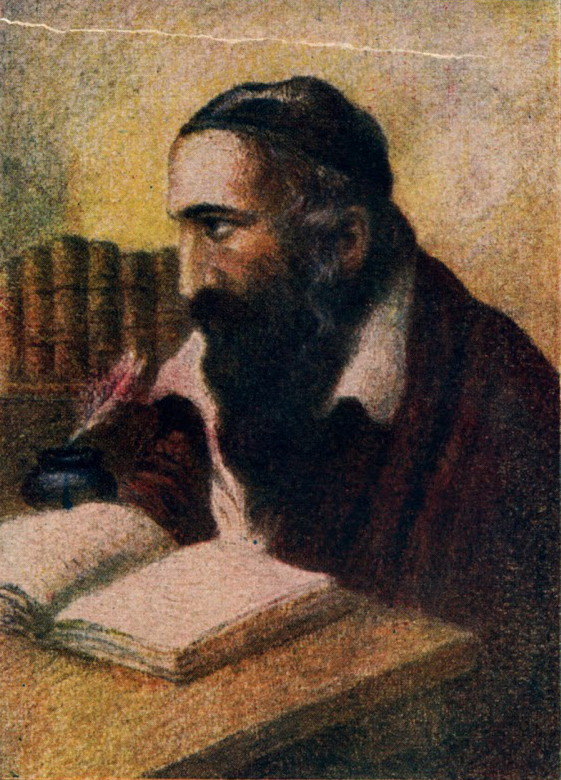 As recorded in a contemporary chronicle titled Emek Habacha, by Harav Yosef Hakohein Harofeh, on the 20th of Sivan in 4931/1171, a blood libel in the city of Blois, France, resulted in 34 Jewish men and 17 Jewish women being burned at the stake. Upon hearing the news of the tragedy, Rabbeinu Tam declared that this day should be observed as a fast day, and special Selichos were written to commemorate the calamity. 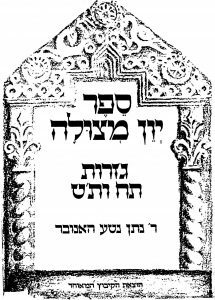 A selichah beginning with the words Shlomei Emunei Yisrael describes the events in detail, and the date was observed for many years. Indeed, some sources state that upon hearing that some students of his brother, the Rashbam (Rabbeinu Shmuel ben Meir), were victims of the massacre, the grief-stricken Rabbeinu Tam took ill and succumbed 10 days later. Nearly half a millennium passed, and 20 Sivan was once again a day of anguish. In 5408/1648, Bogdan Chmielnicki, the nefarious anti-Semitic leader of the Cossacks, headed a rebellion of the Ukrainian population against their Polish overlords. Hordes of Cossack warriors swarmed across the steppes, and on 20 Sivan they began their slaughter of the Jews in the city of Nemirov. Harav Yechiel, Hy”d, the Rav of Nemirov, was among the 6,000 Jews killed in this massacre, and the Shach (Harav Shabsi ben Meir Hakohein) bemoaned the loss of this Gadol hador. Harav Shabsi ben Meir Hakohein, the Shach. In the ensuing months, some 100,000 Jewish souls perished in the onslaught and 300 Jewish communities ceased to exist. The Council of the Four Lands, which was the ruling religious body for the Jews of that region, established the day as a fast. Selichos written by the Shach and others, including Shlomei Emunei Yisrael, were to be recited. For hundreds of years, this custom was observed in many Ashkenazic communities and, until this day, people refrain from celebrating weddings of 20 Sivan. Regrettably, the sensitivities of the youth of our generation seem less affected by arguably the greatest carnage our nation has ever faced. In terms of quantity of victims, the number “six million” boggles the mind. Countries were rendered Judenrein, and a thousand years of Jewish history was wiped out. One would think that a calamity of such massive proportions would and should remain in our consciousness for an extended period of time. Recent events in our communities lead me to believe otherwise. A principal of a local yeshivah, a child of survivors, related how he was so impressed by a “Holocaust Fair” run in his daughter’s school that he wished to replicate it in his own yeshivah. The students would prepare projects on various segments of the Holocaust and present it to parents and guests. He was taken aback by statements such as these from both parents and staff, and try as he may, he was unable to convince them otherwise. “What a sad commentary,” he remarked, shaking his head in dismay. Another recent episode drove this point home, but a bit of introduction may be in order for the uninitiated: The Nazi regime forced the Jewish population of the countries they captured to wear on their clothing a prominent emblem meant both to identify them as Jews and to humiliate them as well. It was certainly not meant as a badge of honor. In many countries the emblem was a yellow star inscribed inside with the word “Jew” in the local language. I remember paying a shivah call to a neighbor whose father lived through the horrors of that era. He showed me a discreet container on his bookshelf which contained a diminutive scrap of yellow cloth. As he unfolded it, he told me that this was the yellow star his father was forced to wear when the Nazis entered his town. It remained on the bookshelf as a reminder of the dark days of his youth, and served as a remembrance both to him and his offspring of the suffering they went through during the dark days of the Holocaust. In August 2017, the Italian design house Miu Miu produced a line of clothing featuring a large yellow star on the chest of some garments. The stars had the name “John” embroidered on them, reminiscent of the “Jude” of the Nazi stars. An uproar ensued when a Canadian shopper noticed this line in the window of the Holt Renfrew store in Toronto and complained that the star resembled the notorious star the Nazis forced the Jews to wear. Yielding to the pressure of its customers, the store removed it from the display window and eventually stopped selling them entirely. The World Jewish Congress followed up on this and confronted Miu Miu directly about the yellow stars, and the company removed the items from their line, despite their pricey retail value and popularity. 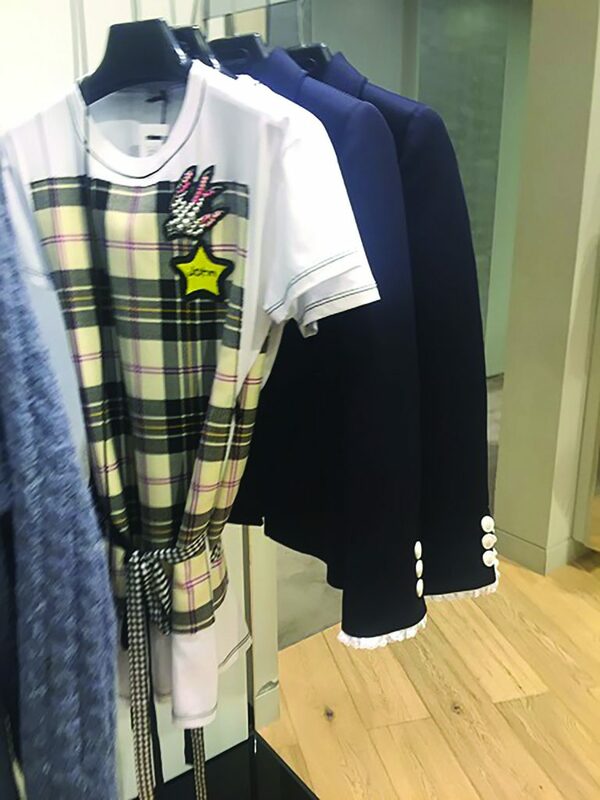 “The World Jewish Congress commends Miu Miu and its parent company, Prada, on its swift attention and action to the concerns we raised regarding the use of the yellow star on its clothing items,” said Robert Singer, WJC’s CEO, in a statement last year. “At this critical time, when anti-Semitism and bigotry are rearing their heads in the public sphere, we must continue to exercise caution and show sensitivity in every sphere and sector.” The Friends of the Simon Wiesenthal Center in Canada also commended Miu Miu for their swift action. Fast forward to 2018. Styles of women’s clothing follow patterns, with last season’s butterflies being replaced with this season’s birds. Presently, stars are “in,” with an assortment of sizes and patterns showing up on the racks of clothing stores. It is hard to believe, but according to a highly regarded proprietor of a Brooklyn clothing store that caters to ladies and teens, the “yellow star” has trickled down to the retailers in our communities. Surprising as it may seem, even Jewish manufacturers have offered this offensive design in their lines for the upcoming season. We can ponder why the younger generation is impervious to these feelings. Perhaps it is because, unlike calamities of previous generations, we no longer live in the land where the atrocities took place, where we had to face the perpetrators in our daily lives. Nevertheless, it behooves us to impart this sensitivity to our children, lest they forget where they come from, what transpired, and what we must learn from it going forward. For if we ignore it, it may just be scratched from the collective memory of our nation like the inscription on the melodica.